Above: Tara Mueller serves to Meridian in the first set. Crossroads Conference Volleyball Tournament this week. Pictured in the front row from the left: Katherine White, Tara Mueller, Hannah Beethe, Katie Mounce, and Kate Jansky. Middle row from the left: Student Manager Emma Olsen, Daisy Kanode, Jaiden Papik, Alexis Turrubiates, Anna Sluka, Cammie Harrison, Student Managers Cameran Jansky and Jozie Kanode. Back row from the left: Student Manager Madison Luzum, Assistant Coach Laura Kroll, Head Coach Darcy White, Assistant Coach Katherine Smith and Student Manager Kiah Songster. 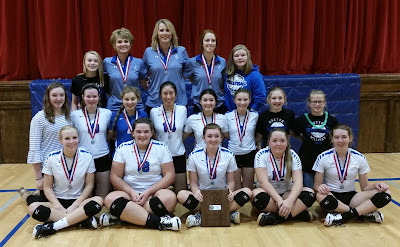 They lost in three straight sets to the D-1 Meridian Mustangs. In the first set the Lady Timberwolves tied it up 20-20 but fell just short with a final of 25-20, second 25-21 and the third 25-13. The coaches and players were excited about a stuff the Timberwolves executed. The Exeter-Milligan crowd got fired-up at the CRC finals after a point for the Timberwolves. The Exeter-Milligan team celebrated a big stuff on Meridian in the CRC finals. Anna Sluka digs the ball for Katherine White to set. Kate Jansky sends the volleyball back over at Meridian. Katherine White gets an ace! Hannah Beethe goes up to block Meridian. Kate Jansky gets the block on Meridian. Tara Mueller sends the ball back over the net to Meridian who handed the Timberwolves a loss at the CRC finals. Katherine White tips the ball over through the hands of Meridian. Hannah Beethe slides the ball through the Meridian block with Katherine White and Tara Mueller watching. Exeter-Milligan super fans were ready for the "white out" at the CRC finals. The Exeter-Milligan band played as the Timberwolves warmed up at the CRC finals.